If you want an experienced money mule, just talk to Niko Bellic. 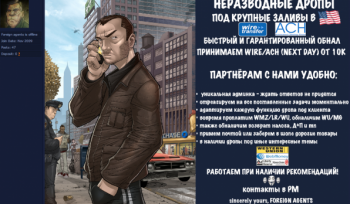 Some of you may recognize the fan art in this shot as coming from the talented Patrick Brown, and of course you know the subject: Niko Bellic, Eastern European criminal protagonist of Rockstar's Grand Theft Auto IV. You may not recognize the terms and condition of the organization Niko's shilling for, but then you're probably not in the market for an experienced money mule. Niko's working for the Russian mob this time, for reals. According to security expert and ex-Washington Post journalist Brian Krebs, the ad offers interested parties access to an experienced and willing set of money mules, agents of cybercrime, based in California, New York, Illinois and Florida. The group specializes in cleaning out hacked business accounts and forwarding the proceeds to the client, for which the group gets 40-45% of the take. "We will react momentarily to any new task," claims the advertisement, offering timely payment via Western Union, Liberty Reserve or WebMoney. The company, Foreign Agents, has been around for about three years, which makes it a veteran in the world of cybercrime. According to Krebs, the typical mule - at least in the past - has been a student from Russia or Eastern Europe visiting the US on a J-1 visa. "Federal investigators familiar with the crime," says Krebs, "say there are J1 money mule recruitment networks in nearly every major city in the United States today." No doubt Niko would approve, but I doubt Rockstar does.